In my office, an entire bookcase is dedicated to books on writing. While you can’t learn writing just by reading a book about it, there are books that can help you plot your novel, create believable characters, revise your manuscript, and improve your writing skills. Since there are so many books on how to write a novel out there, it’s hard to know which ones to read. Maybe my list of personal favorites will help. Despite the title, this book doesn’t cover just self-editing; it covers all aspects of writing. I really recommend it for a basic understanding of concepts such as show and tell, point of view, and dialogue mechanics. Sol Stein’s books is a classic—and for a good reason. Stein was a well-respected editor and novelist. His book addresses both writing fiction and writing nonfiction and includes a great chapter on writing dialogue. This is both a memoir and a book on writing. Read it even if you are not a fan of Stephen King. This is a part of the Writers’ Digest Elements of Fiction series that also includes other excellent books. It covers developing three-dimensional characters and also point of view. One of few books that deals with point of view in fiction. The author, Alicia Rasley, is an editor who also has a blog that I recommend. James Scott Bell explains story structure and how to develop strong openings, middles, and ends. Ms. Yardly’s book will help you plot the turning points of your novel, create a scene-by-scene outline, and get to know your characters better. This to-the-point book explains the benefits of outlining and gives you pointers on how to brainstorm and outline your novel. Well written and fun. Who knew there was such a thing as grammar book that makes you laugh! This is the dictionary I use. There’s also an online version. This very expansive volume will help you out whenever you’re in need of a synonym. The style guide that most companies publishing fiction use. Make sure you (and your editor) are familiar with it. 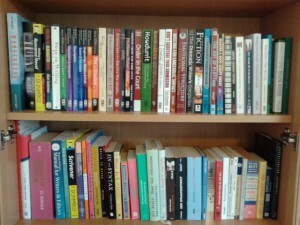 There are many more helpful books on writing, but these are the ones I use most often. If you can recommend other helpful books on writing, please leave a comment.